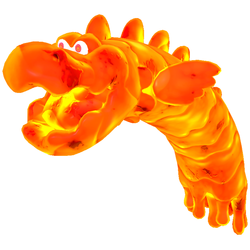 Charvaarghs are a type of Magmaargh that attacks by jumping out of lava at any of the characters. Compared to Magmaarghs, they are lengthier and have appendages resembling wings or fins. Charvaarghs make their first appearance in Super Mario 3D World. They appear in only one level, World Castle-7, Simmering Lava Lake where players must make it past them. If a character touches them, a life is lost, regardless of the character's form. Charvaarghs cannot be defeated by any method. They are also one of the only two enemies (including bosses) that can defeat the player in one hit, the other being Fuzzy Hordes. However, most Charvaarghs only show up when the player enters a Clear Pipe for aesthetic purposes. Charvaarghs return in Captain Toad: Treasure Tracker. They appear in lava stages either coming out of grates which Toad must walk across, or blocking his path where he must run across Dash Panels. They debut in the Rolling Inferno. In this game, they do not instantly defeat the character. Charvaarghs made their Mario Party debut in Mario Party 10. They appear in Chaos Castle in the Unlucky Spaces to take away the player's Mini Stars. ↑ Shogakukan. 2015. Super Mario Bros. Hyakka: Nintendo Kōshiki Guidebook, Super Mario 3D World section, page 225. This page was last edited on April 3, 2019, at 06:31.